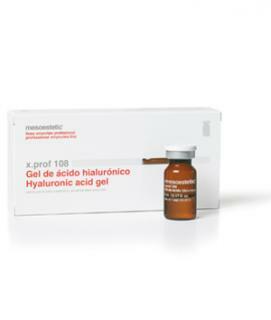 Hyaluronic acid is a natural polysaccharide that belongs to the group of glycosaminoglycans, present in several live tissues. It fulfills a significant function in the skin structure and is responsible for its elasticity. Hyaluronic acid has the ability to retain water at a percentage equivalent to thousand times its molecular weight providing volume and enhancing epidermal moisturising. Due to its viscosity it ensures the cohesion of connective tissues. It activates fibroblastic function and collagen synthesis and several skin growth factors, slowing down natural aging processes. - The cross-linking of the hyaluronic acid chain fills the interfibral spaces of collagen gel, causing water retention, as if it were a molecular sponge, which leads it to be indicated as a treatment to improve scars and wrinkles.